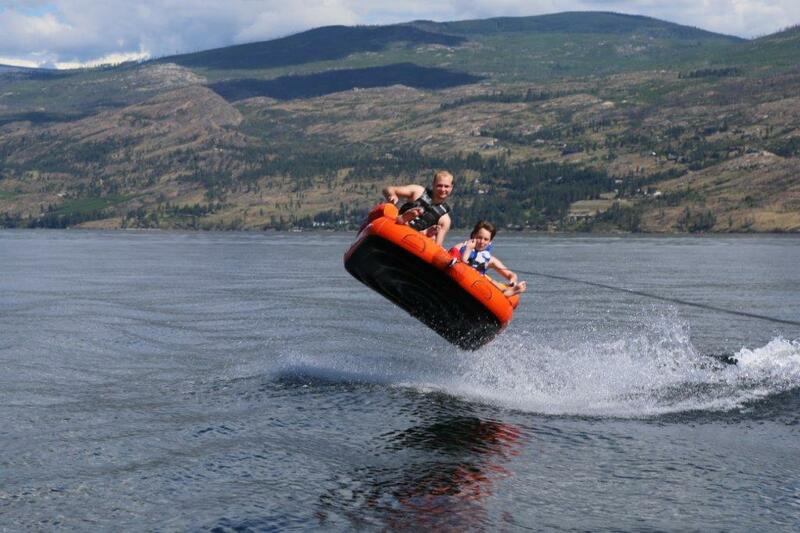 Adventure Tubing on Lake Okanagan. Take your friends and family out for some serious fun on the Lake with the coolest, fun filled, adrenaline pounding, extreme tubes and a Luxury Watercraft!! With Multiple options of what you're riding on and how long you want to HANG ON, you're sure to find the right package for you and up to 7 friends or Fam! There are child friendly options as well. Fun for all levels. Adventure tubing on Lake Okanagan offers 4 great experiences. 2 different water sport tubes and a luxury watercraft! This a BIG towable with a large, deep center crew cockpit for up to two riders and an outside deck radius that can fit at least 3 riders. The cockpit is deep enough to stand in and is for the more timid riders because there is very little chance of falling out. The outside deck is much more adventurous. On the outside the riders can stand, kneel or lay down. Each position on the outside deck has a large anti-slip EVA pad for traction. The floor of the central cockpit is a drop bottom which is what this tube mainly rides on. The drop bottom allows the tube to ride smooth and fast over the wake and in the turns and keeps the outside deck edge from digging into the water. This UTO rides like something from out of this world.! Luxury Lake Tours are proud to introduce you to the modular 3G towable. Grab 1, 2, or 3 of your friends and sit down in the ergonomic, lounge style seats OR flip the tube around and kneel on the neoprene pads while towing the tube from the opposite side...either way works great! !